Apple has now announced its picks for the top apps, games, movies, TV shows and music available on iTunes. These selections are Apple’s choices for 2014 and not necessarily given to the apps that gross the most amount of money or garner the highest number of downloads. 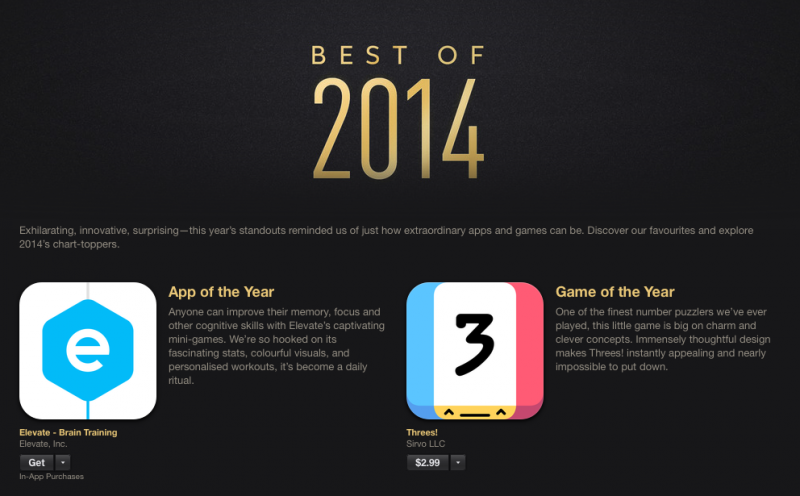 Brain training app Elevate Brain Training was selected as the top iPhone app of 2014. Similar to its educational based choice from last year, Duolingo, Elevate offers brain training games and exercises for iPhone users. It is a free download, but you’ll need to fork out $5 in in-app purchases to unlock the full experience. Instagram’s image stabilization app Hyperlapse app came in second on the 2014 app list. As for iPhone games, Apple has chosen the number based puzzle game Threes!. Also available on iPad, the app has great ratings from iOS users and received positive impressions when it released in February of this year. Apple’s iPad choices for app and game of the year go to the $9.99 “desktop class” image editor Pixelmator and the minimalistic puzzler Monument Valley respectively. Unlike the apps, when it comes to music and media picks, Apple seems have let the numbers make the choices for them. Beyonce is the 2014 artist of the year, Taylor Swift’s 1989 is the top album and Fancy by Iggy Azalea got the nod for the top single. Guardians of the Galaxy won for the top blockbuster film, The LEGO movie took home the best family film and Apple selected Fargo as its top TV Show. You can check out the rest of Apple’s top picks, along with some honorable mentions and a list of the top downloaded apps (led by Facebook Messenger) over on iTunes.